I've started printing a new TPU mount in S3D recently which has a strange artifact on it - it's like the printer decided to add a wall to the geometry that links one corner to the other. At first I thought this was a retraction issue, but watching the printer in action it actually moves at feeding speed, not travel speed, like it's intentionally doing it. From the pictures you can see the added wall is actually quite well printed, it doesn't look like it doesn't belong there. So I looked at the preview in S3D only to find there were no trajectories that crossed that space, and no travels either, it's not supposed to cross the inner boundary at all. Then I looked at the exact line in the preview of the GCode and where the toolhead is supposed to be, it looks like the two positions in question are X113.292 Y89.466 and X112.764 Y121.067, and for some reason it traverses them for several layers instead of printing the outline. 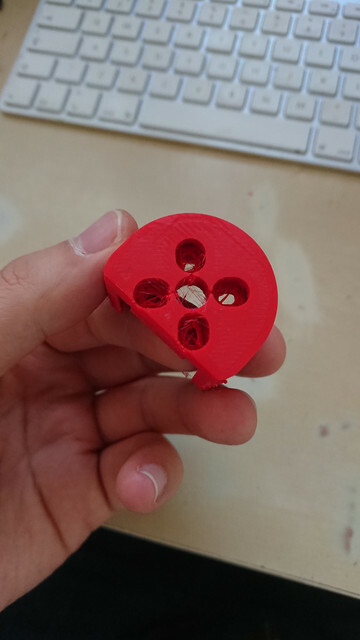 I tried the print on it's own, and in multiples and the issue is repeatable, I have no idea why this is happening now and I need some help. What's also notable is the printer ignores 'pausing' commands through it's physical interface when printing these layers, although that may be coincidence. What could be causing this weird behaviour? I've included a GIF of the finished workpiece, my STL file, the profiles I used (TPU being the one in question) and the GCode I inspected. Before I discuss the issue of this thread......you have far, far too many processes stored in the workspace. One day, you will lose the lot of them and you'll be distraught. Read this post of mine where I explain how to use processes : viewtopic.php?f=8&t=7449&p=32468&hilit= ... ess#p32468 By using and storing processes and profiles correctly, you'll not suffer the pain of losing your valuable settings!!!! Secondly, why have you supplied the Factory File with no shapes in it...and then the shape file as a separate file?? Load the shape, then save the factory file! Now onto your problem. I think you've printed it the wrong way up on the bed to get the best results. You should really place the round side face down...so its sort of looks like a cup! I've been meaning to code those in as material profiles but haven't gotten around to it, I'll take those steps soon but thanks for the reminder. I had assumed the factory file was purely the processes, the purpose is to contain the entire workspace including models? News to me, I'll remember that for next time. I've printed the TPU motor guard in two orientations but it depends on your priorities - if you wanted the walls to be perfectly curved then you'd do what you suggested, however my priority is actually the screw mounts underneath which don't come out with good definition that way. I experimented with putting it on it's side and the results were far superior, now I'm using the variable settings wizard to lower the layer height at the top to assist with the bridging stringing you can see on the left. 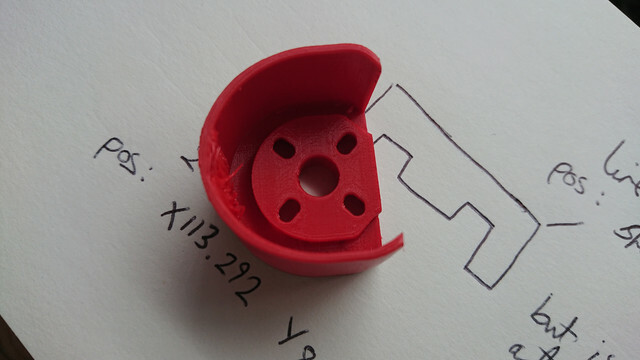 That version was also printed an additional 90 degrees on the Z axis, and now the original problem has disappeared!? Can you explain why this is?